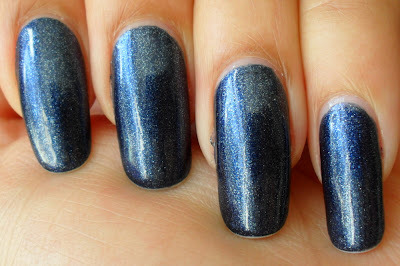 Ash-Lilly's Lacquer Lust: Midnight Mission and my new shop! Midnight Mission and my new shop! I've been busy with my new Shop page...take a look! As a result I'm having a lazy day today (wooo!) and I guess it's reflected in my current manicure. Admittedly, I've been wearing this for about three days, hence the tip wear, but I do have intentions of jazzing it up. Honestly. Not like the last one. This is China Glaze's Midnight Mission and this is the second time I've worn it since this old post. I'm seeing this with some silver design work. Maybe free-hand, maybe stamping - I'm not sure yet. I'll figure it out after I get back from the cinema later. Yes, that's right, I'm going out! Oh, wow! You make a beautiful jewelry! Page looks good, I'm lovin the bracelets/bangles hello bday wishlist! @Biba, I didn't make these myself! I wish I could take the credit *sigh*. There aren't enough days in the week for me! This is just WOAW!!! :D love love it!